Now that it’s February and you’re probably kicking into the key part of the year, we thought you might appreciate a look into other business people’s processes. Meet Paul West – Founder of www.MakeBadges.com.au a promotional products company that makes badges of different shapes and sizes. They generally supply bulk quantities to multinationals, franchises, political parties, government organisations, councils and schools. MakeBadges initially started as a ‘side project’ for a band Paul was playing in 10 years ago. 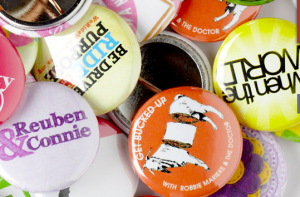 When Paul needed something his band could giveaway at their gigs, he discovered no-one in Australia made the small one inch badges he was looking for and a side-business was born. Although the road was initially slow – “as bands didn’t have a lot of money to spare for things like that, he figured they could reach more people by setting up a website.” And that was the start of a real business being born. Despite having a team who run production, manufacturing and distribution, Paul still deals with customers and the admin. He’s working towards mass customisation and streamlining his admin has been a key part of gearing up for that shift. As a business owner what are some of your biggest challenges Paul? Paul: Growth is our key challenge and that’s a great challenge to have. You wouldn’t do this if you weren’t excited by the challenges that greet you everyday. One challenge that I’m not so excited about though is all the compliance stuff that goes with running a small business. I got into business to make badges but you find out quickly that you need to wear different hats when you don’t have a huge business with lots of different departments to handle everything for you. It’s the keeping up to date with taxation obligations, employment law, workplace health and safety, super.Making sure everything’s done in a timely manner is critical. It’s boring but it absolutely needs to be addressed. What made you want to try Shoeboxed? Paul: I came across Shoeboxed through a business group buying deal that offered a free trial. I thought it sounded useful – more useful than the paper and filing system we were using at the time. I liked the idea of being able to integrate software applications instead of having everything separate. I thought if we could somehow find away to automate the inputs and not have to double handle everything we’d be much more efficient. And that’s super important for me as a business owner. What’s the biggest problem Shoeboxed help you solve? Paul: Shoeboxed made it easy to get paper invoices and paper receipts into a computer system. We don’t have an accounts system or a dedicated book keeper, so the fact that we could pile all our paper invoices into an envelope, send them in and have someone else scan them to extract the data was exactly what we needed. Shoeboxed helped solve the problem of data entry and getting our information from one medium (the pile of paper) to something more meaningful and useable (Shoeboxed’s categorised spreadsheet). Did you have any initial security concerns in storing data in the cloud? Paul: We do a lot of business online, so I wasn’t too concerned about data security or privacy. I thought that if we’re an online business we need to embrace these technologies too. I was, however, more concerned around the security of keeping paper the way we had been – in piles or files. What if there was a fire, theft or something else. Storing that paper in the cloud – where it was backed up properly, was much safer. Reading on the website that Shoeboxed was ATO approved made me feel if it was good enough for the ATO, it would be good enough for us. That Shoeboxed was noticed and accredited by the government after consultations was a confidence booster to giving their services a try. That was three years ago and we’ve been really happy with the service ever since. Have you integrated Shoeboxed with any other software? Paul: We’ve integrated it with Xero and the e-commerce software we’re using. It works really well. It’s a direct integration so we didn’t have to set up anything else. If you want to export to Xero, you just click export all within Shoeboxed. It doesn’t need any third party or middle man integration and that makes it super easy. How do you use Shoeboxed Paul? My preference is to save everything up for the end of the month then send them in as a batch of accounts. That way I can then go through and create all the invoices from the data we get from Shoeboxed. It condenses the amount of time I have to spend on this stuff and means I can focus on the more important parts of the business. What do you think the real value is that Shoeboxed offers customers? Paul: Shoeboxed certainly saved me time and it’s definitely cheaper then employing someone. When you think about it, the service Shoeboxed provides is really good value. I mean, consider how much time it’s saved me from doing the data-entry work or what it would cost to employ someone else to do it. I think that especially at the lower end packages of Shoeboxed $20-$30 a month you just couldn’t employ someone to do that work for that kind of money. Frankly even if you paid someone 10 times that money, you still wouldn’t get it done in the kind of timeframe Shoeboxed delivers it in. What would you say to people thinking about using Shoeboxed? Paul: I would definitely recommend it and have recommended it over the years. I’ve found it saves times and saves money. When running a business you have to look at the money coming in, how much is it going to cost to use Shoeboxed and how much your time is worth to you. When you weigh it up like that, using Shoeboxed is always going to work out in your favour. If you’d like to save money, ditch your data entry and reclaim that time back – maybe actually have a weekend – we’d love to talk. You can call us on 1300 00 1333 or you can get started now with 30 days free.